1 Start with your web browser. (I use three browsers Internet Explorer, Google Chrome and Firefox). Open the browser, then tools and then delete all temporary files and cached stuff, cookies etc. Look in hard disc C and then press advanced options and tick 'include hidden files', files of the system and temporary files. Then click "find". It should come up with a very long list. Delete all the files you can. You can leave the ones you're not sure of. 3 Empty your trash file. 4 Delete all unwanted emails and empty the email trash file. 5 Delete all unwanted programmes by going to control panel : add/delete software and then go through and see what you don't use. Only delete what you are sure of. This can take a bit of time so best do it when you're not busy. Of course you can also buy software that helps you with this, but I always think with a little effort you can do quite a few things yourself on the computer! Podcasting Rules – Sort Of! I just love learning new things. I don't know what I would do if there wasn't a new area to research, a new skill to master or some new technology to embrace. I was always the little girl who couldn't wait to get back to school after the summer holidays, so that must tell you something. As Mary is in California and I'm in Tuscany. I knew that I needed to be able to record on Skype and so began investigating free recording software. I ended up choosing a program called Pamela which has a 30-day trial and duly followed all the instructions to record our interview. Everything was fine and the red record button was merrily flashing away as we spoke. Skype dropped the call after a few minutes and I think that was when the recording also stopped unbeknown to me! The next morning, glowing with pride at my technological achievement (and the fact I had also done a tarot reading for one of the worl'd greats and not make a complete idiot of myself) I went to listen to the interview to find that I had precisely four seconds recorded! What a disaster. Fortunately Mary had just got a new iPod 2 and had recorded the whole thing except for a minute or so at the beginning and the end and so my bacon was saved. I knew that to turn my interview into a podcast I needed some music at the beginning, but there are copyright laws and so I ended up researching what is known as 'podsafe' music. I found one site offering 'podsafe music' for a whopping $59 per track (dream on) and so further research led me to a great site incompetech, offering free downloads. Next all I had to do was record an intro, add music, learn to fade it out and then add the interview. The problem was that my part of the interview was a bit muffled so I went to Youtube to investigate how to use Audacity to clean up audio. After many, many, many hours learning how to edit with Audacity I had got the recording as good as I could make it without going totally insane. I expect by now you are almost as tired reading this as I was editing the interview but finally it was done and I could upload it to my blog. But wait – what's this? The download stopped after about 21% done. I tried again and again and even got up at 6am to try in case it was the internet connection. It wasn't. But after all my hours of work I was not going to be beaten at the last hurdle, oh no. If you want to listen here's the link. Ever since my first Internet download back in the nineties on dial-up in our house in Umbria (time taken: 3 hours, result: half a photo of a Hurricane Spitfire), I have been totally hooked on the Internet. Well, not so much the Internet per se but rather what it offers, particularly for writers and researchers. Let me illustrate this with a little story that happened on Sunday. Look out for all the Internet references! I love metal detecting. I find it relaxes me and switches off my all-too-busy left brain after a few hours at the computer. I have a Garrett Ace 150 and often go on a useful site I found on the net: Gary’s metal detecting to pick up tips. I discovered by looking online at the historic land registry that the house’s land used to be called La Vigna (The Vineyard) and so I always concentrate my search around the area I imagine these people worked, vividly visualising them dropping things for me to find! On Sunday I got the sound for jewellery on the detector and so, surrounded by three patient dogs all sitting looking at the hole I was digging, I found a little medallion covered with soil. I raced back to the house and cleaned it up with a toothbrush in best Time Team style and could just about make out a Madonna on one side and a figure on the other. I took a digital photo and uploaded it then used photo enhancing software to enlarge it. I printed it out but I still couldn’t read the reverse of the medallion. I was pretty sure it said Giuseppe something. I trawled the net using any combination of Italian terms I could think of: medaglie devozionale, Madonna e Giuseppe (yep – Mary and Joseph, not too successful that one!) and finally chanced upon a forum for Italian numismatists, La Moneta.it. I quickly registered, posted my question and a photo and then while I was waiting, took another look at the blown up photo. I was fairly sure it said LABR- something after the Giuseppe bit so Googled that and came up with San Benedetto Giuseppe Labre, the nomad saint. I read all the references to him, including his saint day, when he was canonised and a map of his birthplace. I logged back in to my numismatists site to find a kind soul had answered my question. 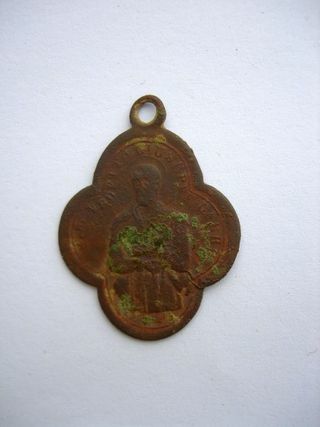 He confirmed that it was indeed San Benedetto Giuseppe Labre, that the medallion dated from 1880-1900 and was copper or brass. Perfetto! I danced into the living room with the medallion, my bits of paper, photo and information and regaled Alan with the story. ‘Remember the Spitfire?’ he said. ‘God, yes, the Spitfire!’ I replied. ‘Can you imagine how long it would have taken me back in pre Internet days to find all this out? Instead of just a morning? The Internet is so fab.’ I zoomed out of the room again and went back to my metal detecting. And all the while I was thinking I wonder who wore this, I wonder who dropped it? And never in a million years would they ever have imagined that over a century later I would be blogging about it.